Sections 1 and 2 proceed from Rayleigh wave theory for isotropic elasticity to an overview of linear and nonlinear surface waves on uniform anisotropic elastic and electro-elastic half-spaces. Section 3 concerns layering effects—in particular the existence of a shear-horizontal (Love) mode and the dispersion of the generalized Rayleigh mode. Section 4 outlines treatments of waves travelling along a wedge tip and of surface waves influenced by corrugation of the traction-free surface. Section 5 reformulates some of the previously-derived nonlinear evolution equations in terms of a physically relevant surface displacement, rather than its Fourier transform. 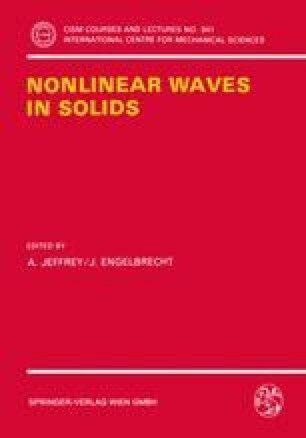 This reveals the essentially non-local nature of the nonlinear evolution equations for surface waves, so distinguishing them from many others treated in this volume.